Praveen Siddannavar's Blog: A Tiger by Night! “Tiger by Night” sounds like a tale from a jungle book isn’t it? 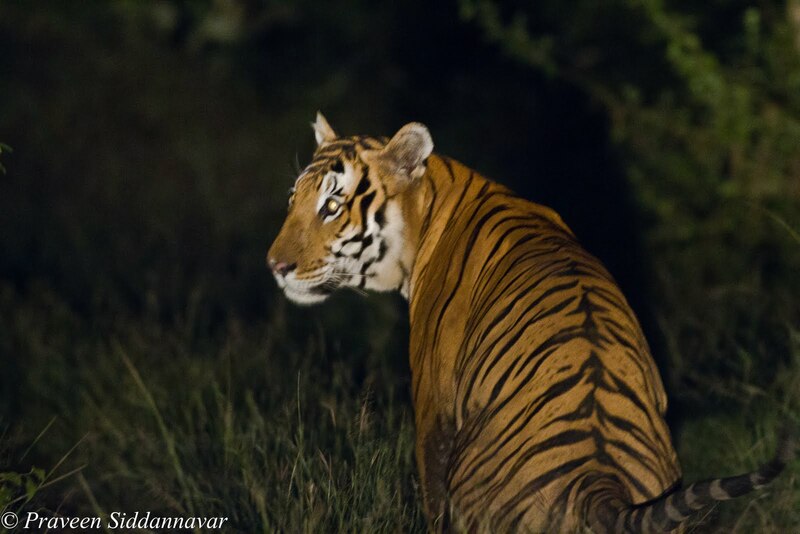 Can you image an encounter with a tiger at night, how the excitement is & how one can photograph under these conditions? 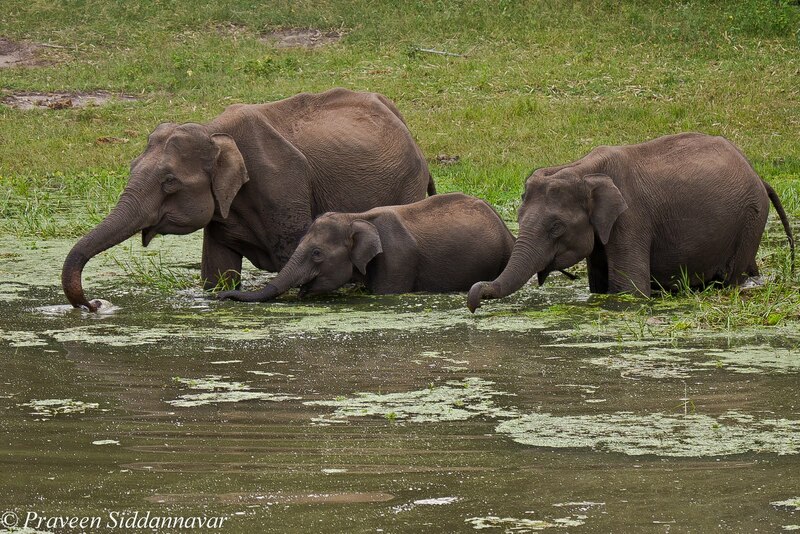 To learn more read my live experience coming straight from my most favorite forest “The Bandipur Tiger Reserve”. On 30th Oct’10 (Saturday) I, along with few friends was on the evening safari at Bandipur Tiger Reserve. 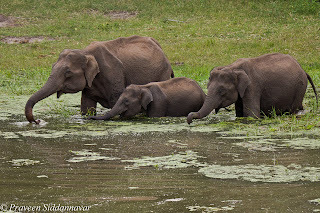 Our safari ride started quite well spotting a herd of Elephants at Mulapura water hole, it was interesting to watch the calf & her interaction with the cow elephants. Later part of the safari ride seemed dull with cloud cover and drizzle during our journey. However I met a close associate of mine Pavitra Kumar (PK) in the forest, who is the manger of a resort known as Dholes Den, he mentioned that they had glimpse of tiger at 4:30pm and unfortunately they could not photograph as the tiger was quick to disappear in the bushes. We were happy to hear that there is some movement & we continued our jungle ride. Further I received call from Basavanna a senior naturalist at JLR- Bandipur, even they had a glimpse of tiger that disappeared in the undergrowth & moved towards border road. No matter how many ever times you see a tiger in the wild, your excitement is the same as if one sees it for the first time. We were in opposite direction when I received the call; however we decided to try our luck to track the tiger and asked our driver Ramesh to drive towards border road. Border road is the point where Bandipur forest in Karnataka State ends and Mudumalai forest in Tamil Nadu state begins. Time was running out, dark clouds were hovering right above us, it was almost 6pm and it was getting really dark. To make things worse it started to drizzle, I asked Ramesh to speed up and suddenly I noticed a safari van of JLR on our left track, that was reversing, I asked Ramesh to stop, by then Guru Dutt another naturalist of JLR from the van peeped out & whispered that they just had a glimpse of the tiger that disappeared in the bushes hence they were reversing in search of it. Our excitement increased, I was getting a feeling that I am almost close to tiger. At the point where we stopped, there were three routes, one on the left where the van was reversing, on the right the route would end due to border and straight ahead which would lead to the border road check post. We waited in the middle for a while. Normally during dusk tigers can’t stay in bushes for long, they would prefer to walk freely on the man made tracks on which the safari vehicles ply. The reason is quite simple no animals would want to be in bushes and get insects or mosquito bites, it is irritating to humans and same goes with animals. Somehow I was confident that the tiger will come out, it was 6:15pm we were getting late & must reach the exit gates else forest dept will close and lock the gates. 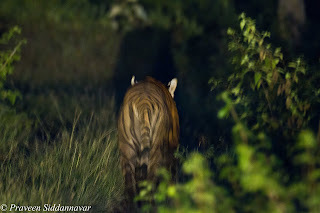 It was almost dark, we could hardly see anything, and suddenly at a distance I noticed some animal moving on the track right ahead of us, is it a Sambar or a Tiger I asked? By then our driver Ramesh was quick to start the jeep & drove closer to the animal, as we went closer we were excited to see the tiger walking, everyone started clicking but failed to get a single image. It was pitch dark no chance of getting images through DSLR’s. As a rule of the jungles we shouldn’t use flash to click images in the wild. I asked Ramesh to put on the head lights of the jeep; as the lights were on, we could clearly see the tiger walking on track. At one point we tried going closer and as expected the tiger disappeared into the bushes and we couldn’t see anything. We waited for few minutes and started to drive without keeping the head lights on, it was so dark that we had to drive at less than 20 km/hr, suddenly the vehicle behind us switched on the headlights and my friend Deepak who was in the front seat screamed, it was a mere coincidence that the headlights from the rear vehicle was switched on and the tiger popped out of the bush and tried to come on the track and almost bumped into our jeep, the tiger growled at Deepak who was in front seat without any door as we were driving the Commander Jeep. It was really scary, the tiger continued to walk and we followed. I was desperate to get some images, had never clicked a tiger image at night. After a while we noticed that the tiger stopped on the middle of the track, probably it was scent marking. This time we gave him enough space and lights were on again. I grabbed my camera and changed the setting by increasing the ISO to 6400 the maximum in Canon EOS 7D model. I was at the rear seat. I had to put one of my feet on the rear foot board, the other one was hanging out, used one hand to hold the roof top rod and with other hand carried my huge heavy weight 500mm lens. This position provided me a clear view of the tiger from roof top of the jeep. I fired few shots without wasting much time, I knew the shutter speed was extremely low, but was lucky to manage few shots; it is hard to believe that I managed these shots, with shutter speed of 1/25 sec, 1/15sec & handholding the heavy lens..
After reaching the JLR resort most of the guests could not manage shots even at 5:30pm due to low light, I was fortunate to get reasonable sharp images at 6:30pm while it was pitch dark, two sources that helped me were the head lights of the jeep and the instant idea to increase the ISO to 6400.This is a good live test record for Canon to advertise and prove the ability of Auto Focus of Canon 7D to shoot under extreme low light conditions. Though I have had several encounters with tigers, but this experience was something different and will remain in my memories for a long time. Wow! Really interesting as i was reading your blog, so immersed I was into it, that I myself felt that I was part of your team to see the tiger. Even i would like to capture this magnificient animal in wild. Also you are quite lucky you managed to capture the tiger in night, when some people don't even get to see it during daytime. The pictures are also stunning, awesome. I thinkof all the blogs that i went through yours is the one where the tiger was captured in lenses during night time. Thanks for sharing your experiences and pictures.